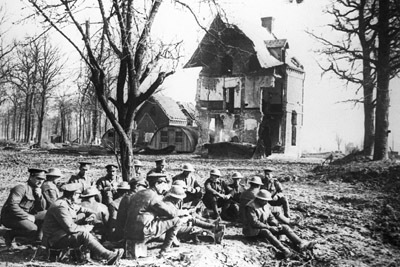 In early 1918 the Allies awaited a German attack. 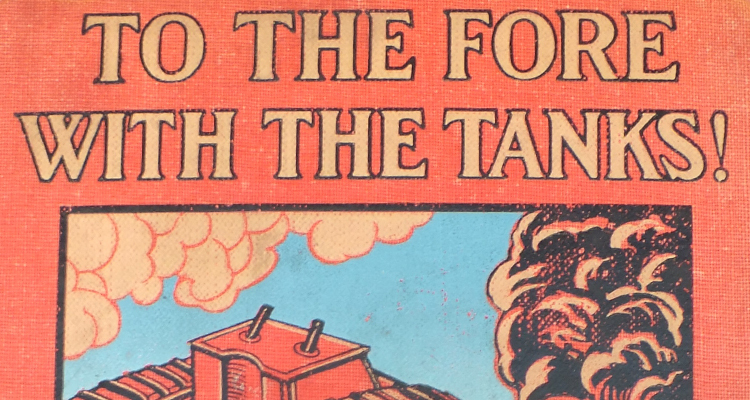 Defeating it would be a practical military challenge for the entire British Army, but it also posed a more existential problem for the Tank Corps. 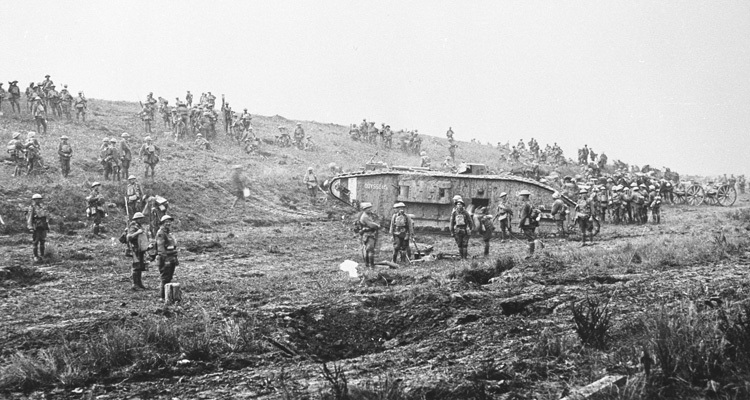 Tanks had been developed as a way to cross No Man’s Land and overcome barbed wire and fortifications. They were fundamentally an offensive weapon. With the British on the defensive, what would their role be? 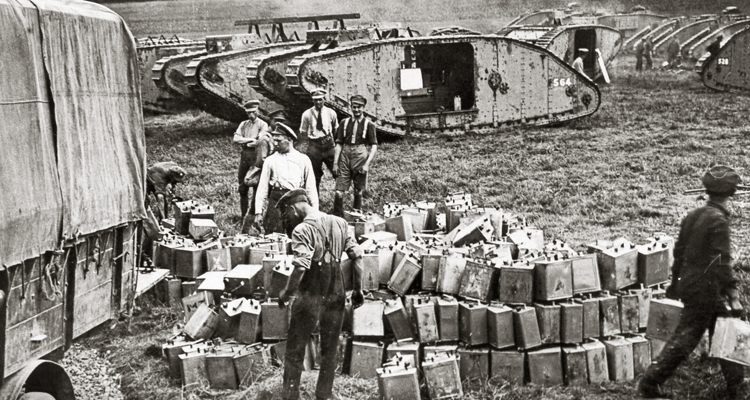 Over the course of the war so far, the British Army as a whole had got better and better at the art of the attack. However defending was largely unfamiliar. It required a different mindset, and one which had not permeated through the ranks. To make matters worse, the British had only recently adopted a new defensive doctrine, modelled on the formidable German system. Rather than continuous trenches, the British line would now be composed of a Rear Zone, a Battle Zone and a Forward or Outpost Zone. 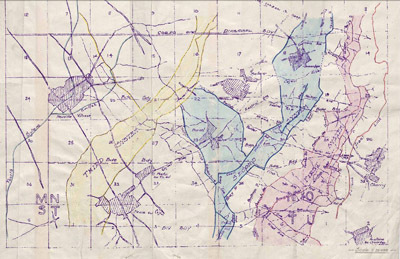 The idea was that troops in the Forward Zone, made up of spread out but mutually supporting outposts, would provide warning of a German attack then conduct a fighting retreat, delaying it, breaking it up and channelling it into the Battle Zone. This was where it was intended the attack should be defeated. Under fire from infantry, artillery and machine guns, as German soldiers crossed the Battle Zone they would take heavier and heavier casualties, run short of ammunition and get increasingly tired. The Rear Zone would serve as a backstop if the Battle Zone was overrun. It also served as an area to hold rested, full strength British reserves ready to counter attack their weakened enemy, either stopping their advance or possibly forcing them to retreat. Implementation of this new doctrine was affected by two problems. The first was a shortage of manpower, meaning there weren’t always enough men to construct the Rear Zone positions. In many areas, therefore, this simply couldn’t be done. For the same reason, even if the positions had been built, the reserves needed to man them often didn’t exist. It would fall to men like these to stop the German attack. The second problem was poor understanding and implementation of the doctrine throughout the Army. 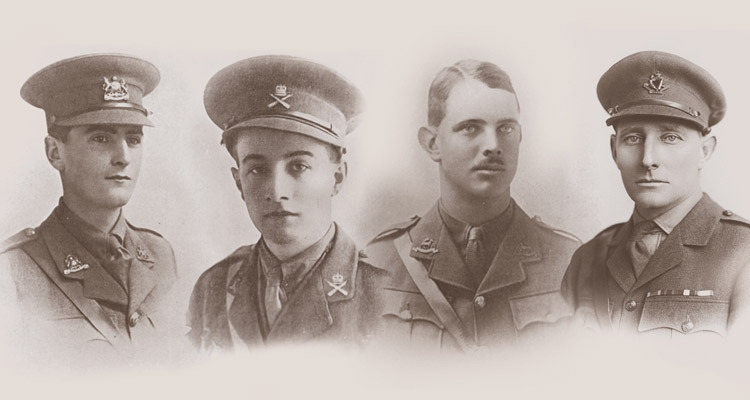 The quote above was made by an experienced Non-Commissioned Officer, and refers to the distributed outposts in the Forward Zone, a stark contrast with the continuous trenches he and his comrades were used to. This zone was supposed to be lightly manned and progressively abandoned if attacked. It wasn’t designed as a defensible position. However, many divisions packed too many infantrymen into the Forward Zone (up to a third in some units). This was understandable, as it was a more familiar approach, and it was reassuring to less experienced soldiers to have their comrades alongside them. However it rendered large numbers of men vulnerable to being outflanked and cut off. 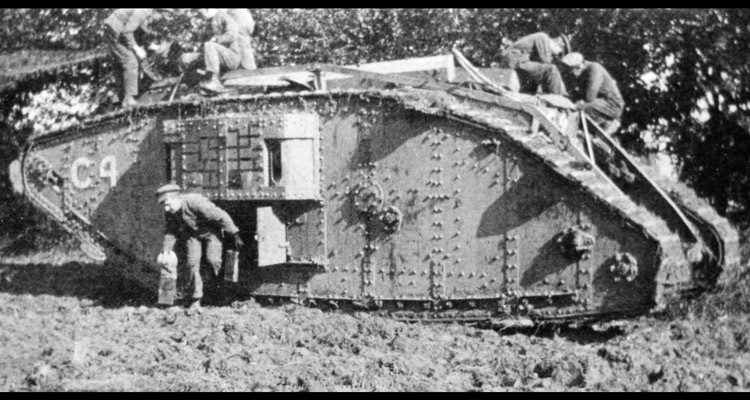 The role of the tank in the British Army of the First World War was to support the infantry in overcoming German defences. As the British transitioned to the defensive Tank Corps commanders and the Army’s General Headquarters considered what role they might play. It was decided that most tank units would be concentrated and positioned with the reserves in the Rear Zone to support counter attacks. This played to the strengths of the tank as an offensive platform, avoided dispersing them in penny-packets, held them far enough back from the front to minimise the danger of being overrun in the first German attacks and added a great deal of power to the vital counter-attacks. 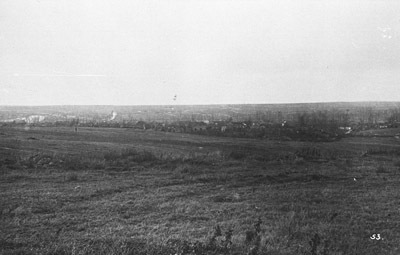 French countryside, over which the Allies knew the Germans would soon be attacking. However not all the tanks were to be used in this way. Commanders allowed that “In certain special cases…it may be advisable to employ a few tanks from concealed positions on reverse slopes or in valleys as mobile machine gun units.” These vehicles would be positioned further forward, in the Battle Zone, and would, in the words of the Tank Corps commander Hugh Elles, “emerge like Savage Rabbits from their holes” to attack advancing German forces in the flank or rear. On the face of it there are major differences here, in that the ‘Savage Rabbit’ concept would use small numbers of widely spread tanks, their operations would be more improvised than the larger counter attacks, and they would be positioned much further forwards. 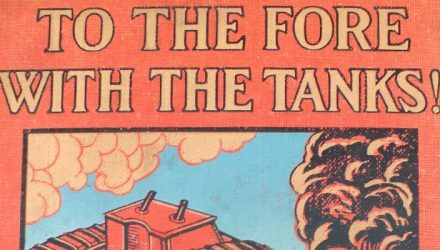 There is one important similarity though – even within the context of a defensive battle, the tank was still to be used as an offensive weapon. Despite the fact that only a minority of tanks were ever earmarked for this role, the phrase caught on across the Corps, and tank men often referred to the spring of 1918 as the ‘Savage Rabbit’ period. Thank you for the compliment Solomon.